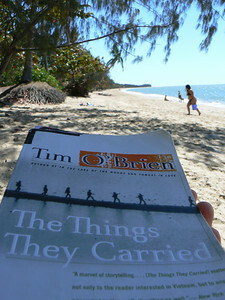 Context: Read this on Holloways Beach, just north of Cairns as we settled into the sand for a day. A true war story is never moral. It does not instruct, nor encourage virtue, nor suggest models of proper human behaviour, nor restrain men from doing the things men have always done. if a story seems moral, do not believe it. If at the end of a war story you feel uplifted, or if you feel that some small bit of rectitude has been salvaged from the larger waste, then you have been made the victim of a very old and terrible lie. There is no rectitude whatsoever. There is no virtue. Forget Band of Brothers. According to O’Brien, Speilberg doesn’t know what he’s talking about. Or, at least, if he does, he’s lying through his teeth. After reading The Things They Carried, I’m inclined to agree. But I think the reason why O’Brien’s quote rings true has more to do with Vietnam than war in general. The Second World War is a tale told, by and large in the western media, as one of heroes, as one of good defeating evil, as one of right triumphing over wrong. That just has to be questionable. How on earth can total war be so black and white. O’Brien’s book demonstrates very very well that it just ain’t so. What makes O’Brien’s task easier is that the Vietnam war, perhaps because it was a resounding defeat for the US and it’s allies at the time, isn’t so easy to hose down and polish to a cheery sheen. War is repugnant, messy, unfinished and unfathomable. It is indicative of our willingness to imbibe the “very old and terrible lie” that WW2 stories can leave us feeling uplifted in any sense and that there are whole realms of media out there that actually set out to do this. It’s testimony to truth that most Vietnam media do not. You only have to compare something like The Dam Busters with Full Metal Jacket to see that we’re getting somewhere in our quest to tell it as it is. But Band of Brothers bucks this trend and continues the age-old, let’s remenisce about how wonderful WW2 was really. Spielberg deliberately sets out to make you feel good about what the Allies did in Europe. But it’s hideously sanitised. We committed atrocities everywhere and we left millions of people unable to make sense of or come to terms with what it meant to be involved in the Allied thrust into Europe. None of that is dealt with adequately by Spielberg. At the most, we have people daydreaming about their experiences in flashbacks that don’t even make them break a sweat. And let’s not forget that the Allies were just as hungry for lebensraum for their own ideologies as Hitler was for his. It’s just that, like most hypocrites, we need to generate the right spin to justify our behaviour to the masses. As a writer, all you can do is pick a street and go for the ride, putting things down as they come at you. What a beautifully idyllic island, the perfect place to relax and read these books, sensational.